Oculus Rift | Yeah, But Is It Flash? We had an Oculus Rift in the office the other day and I think it has the potential to be a real game changer. In fact, after only a few seconds inside virtual reality I was sold by the Rift’s amazing immersive experience. First up was the Sixense Tuscany demo, which was a great introduction to help me steady my VR legs. My first thought was ‘Star Trek Holodeck’. Even though I needed a joypad to walk I still felt as if I was actually part of the game world. Being able to quickly look over my shoulder just felt so natural and right. And there was a very real sense of elevation when standing on balconies and platforms. It’s these simple things that bring everything to life. Next I explored the oceans; swam with a school of fish then brushed past an enormous whale. Everything just looked so solid and, well, there. On several occasions I caught myself trying to reach out and touch things. My deep sea adventure came to an abrupt end when I was eaten by a shark. I was actually looking the other way when it got me, but I have been informed that staring straight into the shark’s deep black eyes is quite a terrifying experience. In fact, my buddy Ian ripped the headset off on his first encounter with it. The last demo was actually my favourite. RiftCoaster takes you on a roller coaster ride through the medieval Epic Citadel map. Climbing up to the top of the first dip was astonishing as I took in the view of the city’s impressive towers and spires. Before I knew it I was shooting down the other side and gripping onto my chair for dear life. Even without the g-forces, there’s something about the whole immersive experience that tricks the brain into believing you’re actually rattling along a roller coaster track. It’s even better when you’ve got someone to shake your chair for you! The headset is surprisingly light and comfortable. Oculus Rift certainly isn’t the finished article yet but unlike PS4 and Xbox One, it has got me super excited. The headset’s screen resolution definitely needs increased. While it certainly isn’t terrible it does break the illusion a little. It’s also quite tricky to configure the Oculus Rift with you having to muck around selecting the correct lenses to use. Also, pushing your head forward doesn’t have any effect. It might not seem like a big deal but it is when you try and lean out of a window only for nothing to happen. It’s also slightly disconcerting when you can’t see your own hands in front of your face. Of course, with Xbox One and Kinect that could all be rectified. It would be quite incredible to be able to look down and see your whole body. With Kinect that’s entirely possible and I’ve already seen some early demos that have successfully gone down this route. In fact, if Microsoft were to have the sense to embrace the Oculus Rift then it could give people a real reason to buy the Xbox One. I really can’t wait to see how this pans out over the next year or so. Hopefully we’ll see some big name games studios produce great games that take advantage of the Oculus Rift. Personally I’m holding out for a remake of Stunt Car Racer. 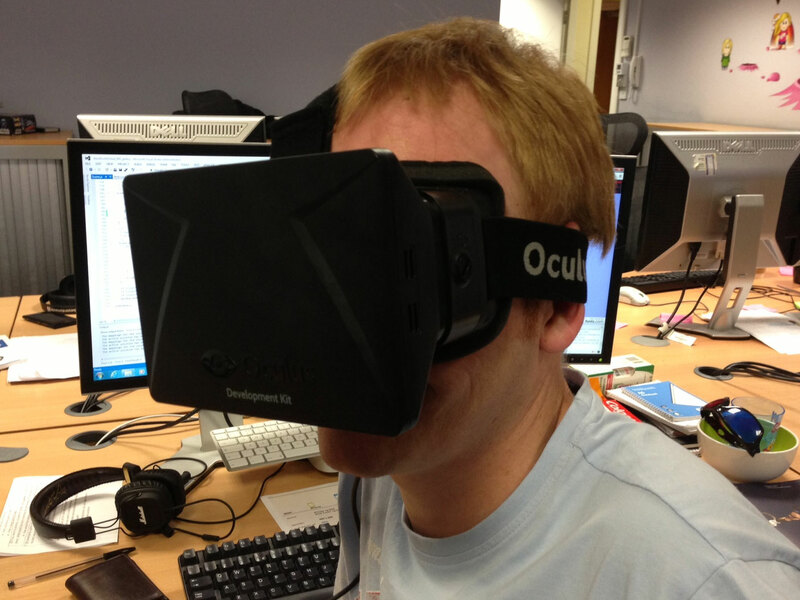 A huge thanks to Ian for bringing his Oculus Rift into the office for everyone to try out.